Chigger Foot Boys' by Patricia Cumper MBE opens at Tara Arts next month and, as part of this, Strongback Productions are offering free workshops and theatre tickets to 15-22 year olds. 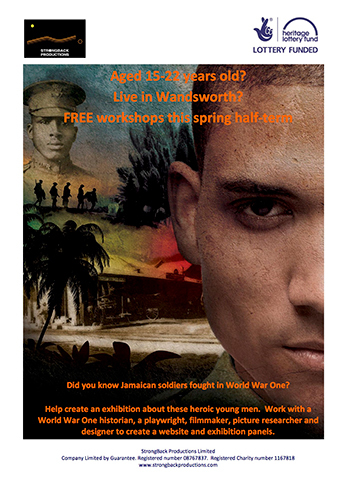 This new play follows the lives of four Jamaican soldiers who fought in World War 1. Following on from initial workshops, Strongback Productions we are now offering a group of young adults the opportunity to work alongside Patricia Cumper, a historian, a designer and a filmmaker to help create a multimedia exhibition about these heroic young men. This is totally free of charge - they will provide travel expenses to those who are not local to Wandsworth - and participants will also receive free tickets to the press night of the show (Friday, February 24, 2017. This is an excellent opportunity for young people to learn about film making, theatre and media, as well as providing an insight into an inspiring part of history that is sadly left out of the national curriculum. Strongback Productions is a new BAME theatre company, working hard to document and celebrate BAME contribution to British cultural life, and to engage and inspire young people both locally and beyond.